Several months ago I thought that it would be fun to create a video trailer for the release of Then I Became a Mother. Ah, young idealism. Within days, I had drafted a script and contacted a local videographer, a young man whose previous gig had been to film an alligator hunting expedition in the Everglades for a television station devoted to outdoor sportsmanship. I'm sure that he entered my house convinced that filming three children in their natural habitat would be easier than filming carnivorous reptiles in a humid, mosquito-infected swamp. Roughly a half hour into the shoot my oldest daughter began to speak in jibberish, which, like a good mother, I attempted to ignore. Finally, I made out a garbled, cryptic claim: "Mob, my lib felbs fubby." What? She repeated herself slowly. "My lib. It felbs fubby." I did a double-take. For no discernable reason, her bottom lip had swollen to double its normal size like she had been overdosing on collagen injections. The videographer opened his mouth, closed it, and scratched his head. "Maybe we'll film her from behind." We were just getting warmed up. The longer the filming continued, the goofier my four-year-old got. The room was too hot; she wanted to strip off her clothing. Walking was so boring; she wanted to roll across the floor. Dusk began to settle. We rigged additional lighting sources to illuminate our set, which means that I unearthed the two photography lamps that my husband had snagged at a garage sale for $2 a piece this summer -- the two lamps whose purchase I had railed against. "Why photography lamps?" I had questioned. "When will ever we need mega-watt lighting?" As I plugged in one lamp, I was momentarily blinded by its center-of-the-sun intensity. Yes, this would work. I alternatively contemplated how my husband was right (again) and how I might have retina damage until I was interrupted by the videographer. He pointed to my two-year-old. "Um, you might not want her to be doing that." His statement was an accurate one. The child was dipping a plastic bowl into the toilet and drinking toilet water. I had wanted a real-life video to capture the essence of motherhood, but this was a little too real. It's safe to say that a lot of editing has been done. And since I was shell-shocked and partially blinded by the entire experience, thus impairing my reasoning skills, I kept rolling with the chaos and created a second Then I Became a Mother video trailer. Enjoy, and by all means, spread the word! 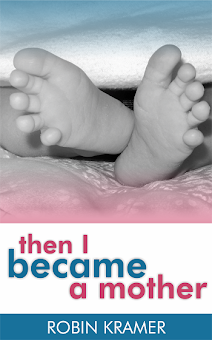 Visit the Then I Became a Mother website to read a sample chapter and discover FREE resources for moms. You'll find activities for kids, ice breakers and activities for mom groups, and discussion guides for the book! Email Subscribers: follow these links to view video one and video two. Real is good!! In this case....VERY GOOD!! So happy for you and all that God has blessed you with! I can't believe how often you make me smile ear to ear while I'm 'listening' to you talk through your words. These trailers are awesome, though I do think the toilet water drinking should have been in there. Oh my gosh. Making you smile = music to my ears. Glad you liked the trailers! I don't think we have any actual footage of the toilet-water-drinking, but yes, that would have been mightily "real." Shana, thank you SO much! MAN I miss walking into and out of a store without it being a production! I know! I once told my husband, "We used to enter. Now we invade." Love it! I would LOVE to see the blooper reel! :D Excellent job and I'm putting the book on my christmas list. Love your blog and your writing! Thank you so much, Amanda! While filming, I had the sinking suspicion that the entire thing was fit for the blooper reel!